If you think beans are something to buy in a can or that they must be baked with brown sugar to taste good, then it's high time you tried Moroccan loubia, or stewed white beans. This classic, flavorful dish is much loved in Moroccan homes, where the beans and zesty tomato-based sauce are traditionally scooped up with bread. It's a comfort food that stands alone as an entrée, but it also works well as a side, particularly to fried fish dinners. Make the stewed white beans as spicy as you like, but don't be shy on the seasoning, as you'll want enough of those Moroccan spices to yield a characteristically robust sauce. Olive oil provides another key flavor, along with fresh tomatoes, onions, garlic, and herbs. Take the heat up a notch by adding a chili pepper or cayenne, and consider adding beef or lamb. Please note that this recipe calls for dried beans, which do require overnight soaking in ample water. Plan ahead so that you remember to soak the beans the night before cooking. 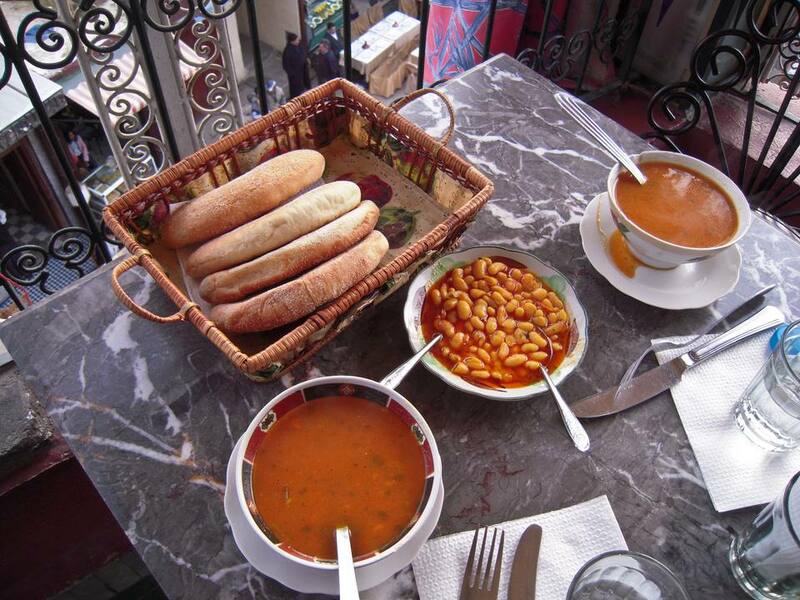 The cooking time is for preparation in a pressure cooker, which is regarded as essential cookware in Moroccan kitchens. Allow double this time if you'll be stewing the beans in a conventional pot. To make the loubia, choose one of these two cooking methods. Mix all ingredients in a pressure cooker. Add 2 quarts/2 liters of water, and bring to a simmer. Cover, bring to pressure, then cook on pressure over medium heat for about 40 minutes, or until the beans are tender. If the beans are still submerged in sauce, reduce the liquids until the sauce is thickened. Adjust the seasoning if desired, and serve. Add 2 quarts/2 liters of water and bring to a simmer. Cover and simmer the beans over medium heat for about 1 1/2 hours, or until the beans are tender and the sauce is thick and no longer watery. If the liquids reduce too much during cooking, add a little water to prevent the beans from burning. Note that the beans should be quite saucy at serving time. The beans will continue to absorb liquid as they sit, so allow for this if preparing the beans in advance for later serving. White beans can certainly be eaten with a spoon, but they're also very good scooped up like a dip with crusty bread. If you want to add lamb or beef, brown the meat (cubed or in 2-inch pieces) in the oil and then proceed with the directions as described. Refrigerate leftovers once the beans have cooled completely. If necessary, add a little water when reheating and use no more than medium heat to avoid scorching.